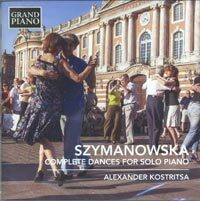 Description: MARIA SZYMANOWSKA (1789-1831): 18 Danses, 24 Mazurkas, 6 Minuets, Polonaise sur l’air national favori du feu Prince Joseph Poniatowsky, Danse Polonaise, Cotillon ou Valse Figurée. We offered a three-disc set of this Polish woman composer’s complete piano music back in July 2013 (07P021). Those of you who may not have wanted all that much music can now have what’s described as her “complete dances”. Szymanowska was one of the first fully professional travelling pianists of the 19th century she was also among the first to produce stylized versions of Polish dances. Alexander Kostritsa (piano).